Greg Gabriel: Was It A Mistake To Start Peterman? Was it A Mistake to Start Nate Peterman? Following the disastrous results of yesterday’s humiliating loss to the Los Angeles Chargers, many are saying that Head Coach Sean McDermott made a mistake by starting rookie Nate Peterman. I’m here to say no it wasn’t, and if given a chance for a do over I’m sure McDermott would make that same decision. In the National Football League anytime you start a rookie quarterback the team is taking a chance. It goes with the territory because of the rookie’s lack of experience with the high level of football being played in the National Football League. The young quarterback is going to make mistakes, the team just hopes he keeps them to a minimum. As the saying goes, the team doesn’t ask the rookie quarterback to win the game, but rather not lose it. In the case of Peterman yesterday, he lost it and lost it quickly. Before I get into why he lost it, let’s examine why he was put into that situation to begin with. The Buffalo Bills were on a two game losing streak and the offense was not producing. The wide receiver corps was among the least targeted receiver groups in the NFL. Tyrod Taylor was ineffective with his play because of his limitations. He is a slow processor, and when forced to play from the pocket he struggles to see the whole field and make the proper decisions. Nate Peterman, on the other hand, during the preseason and with his minimal play a week ago showed the opposite. He could make quick decisions, get the ball out of his hand quickly and throw with accuracy. The hope was that Peterman would get the wide receivers more involved in the game and that in turn would help the run game. Peterman started off fine. He completed his first two throws including a 20 yard dart to Kelvin Benjamin over the middle. Then disaster hit. The Bills went into the game with starting receiver Jordan Matthews out with a knee injury. On the throw to Benjamin, Kelvin took a hard shot to his knee and left the game. The Bills now had to play with a rookie quarterback who didn’t have his top two receivers. Peterman’s next throw was to fullback Patrick DeMarco in the right flat. It was a good throw and the blocking was there for a potential midsized gain. The problem was Demarco dropped the ball and it fell into linebacker Kory Toomer’s hands, and he returned it for a 59 yard touchdown. When adversity hits a rookie quarterback early in a game, things can begin to spiral out of control. The Chargers, knowing this, then tried to aggressively pressure Peterman and they succeeded. The next two interceptions that Peterman threw really weren’t his fault, as he was hit while throwing the ball, forcing the throws to be off target. In the NFL that doesn’t matter. Turnovers can kill a team, especially a team that is struggling like the Bills. From that point on, it was over for Peterman. He reacted like a rookie in his first NFL game who faced huge adversity. He pressed and instead of improving, got worse. We know the result, five interceptions in the first half. This game might go down as the worst debut by any quarterback in League history. As poorly as Peterman played, I doubt that this is the last we see of him this season. The Bills started him in the first place because they saw something in him that led them to believe he can be an NFL starter. I thought, and still feel it was the right decision. Next week the Bills play the struggling Kansas City Chiefs. The Chiefs started out the season looking like the AFC’s best team but now have lost four of thier last five games, including to the lowly New York Giants yesterday. The Chiefs are coached by McDermott’s mentor Andy Reid and we can bet, this game is particularly important to him. I would think that he will start Taylor with the hopes that the defense shows some improvement, and the game can be close and decided in the fourth quarter. We’ll find that out next Sunday. 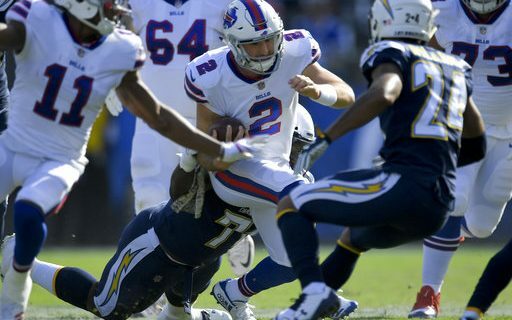 The problem the Bills have at quarterback is that when Taylor relieved Peterman to open the second half, he did nothing to dispel the reason why he was benched in the first place. Sure the stat line wasn’t bad, but he didn’t play effectively, and he was playing against a Charger defense that already had a huge lead and lost some of their aggressiveness. The following week the Bills host the Patriots who will be trying to wrap up another AFC East title. That won’t be the time to play the rookie again. My feeling is that if Taylor continues his lackluster play, we will see Peterman against the Indianapolis Colts on December 10th. The Bills will hope that he plays much differently than yesterday.